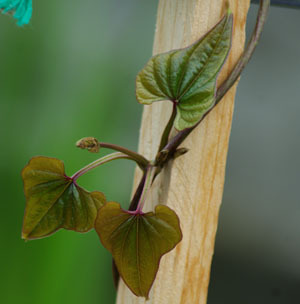 (Yamaimo, Japanese Wild Yam, Glutinous Yam, Japanese Cinnamon Vine, ) The local name for the tubers is “mukago.” Herbaceous perennial vine native to Japan. 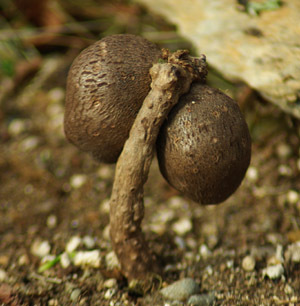 Vigorous plant produces highly nutritious tubers, both underground and aerial. 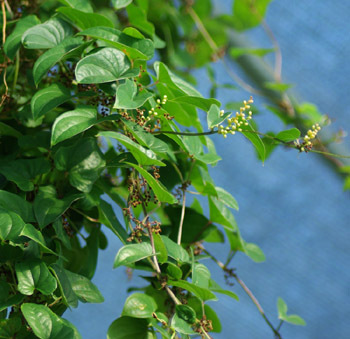 Distinctly comely heart shaped leaves, and spring flowers that smell deliciously of cinnamon. Plant prefers full sun to part shade and rich garden soils. Does excellently in a hot, humid greenhouse and can be grown outdoors in warm garden sites in the temperate north. I find that these germinate best when pressed into the surface of the moist medium. This is similar to the way the plant self-sows in nature, and it is good at doing that. The surface-sown tuber elongates down into the soil and makes fine roots, then sends up a shoot when weather permits, usually in the spring. Provide a trellis. 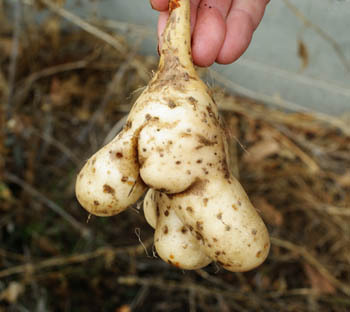 Large underground tubers take 2 years to form. Space plants 2 feet apart.